Image published in our site becomes able to identify copyright information by digital watermark acuagraphy of SBI net systems. Pear of Shiraoka-shi is called by nickname called "Shiraoka beautiful woman" and is special product of Shiraoka-shi to boast of eminent harvest in Saitama to. History of pear cultivation of Shiraoka-shi initiates the Kimuras of Kayama village Shibayamashigo (existing Shobuchou) into cultivation technology of pear which gojuranhachigoro from nansakigyokugunsankamura (existing Shobuchou) learned in Gunma and Chiba in 1890, and there is what we were informed by the Katos of Araishinden (Shiraoka-machi) of relative sinew from the Kimuras for 36 years by opening. It was big opportunity when pear cultivation spread that pear had light shelf kakeoshiteitatame damage whereas other crops suffered crushing damage in the case of deluge of August, 1910. In addition, many farmhouses came to shift to pear cultivation from sericulture because price of raw silk slumped by the world financial crisis in the Showa early days because there were many incomes, and pear at the time was advantageous as cash crop. 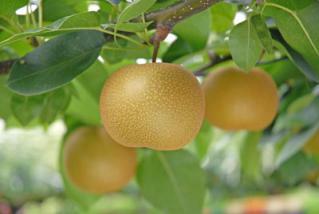 By effort of many people concerned, it became straight production center of the prefecture eminent pear afterwards. "Good luck water" "brimming with water" is the center, and produced kind is occupying approximately 90% of whole amount of production with these two kinds now in our town. Harvest of pears begins with good luck water of the beginning of August and invites Best time of crop of brimming with water when it is September.